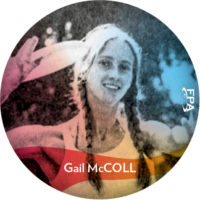 Gail was one of very first women freestylers. She was graceful, athletic, poised with great timing and balance. She was also highly innovative creating an athletic style. She would later marry and start up Discraft with Jim Kenner. Gail is the original Women’s Freestyle World Champion.